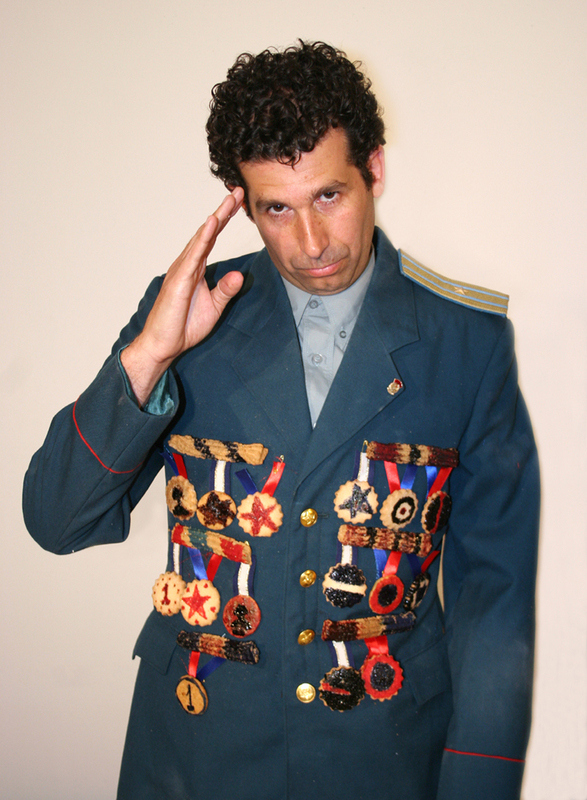 In the video the artist stands in front of the camera while wearing an unidentified military uniform of General or any senior officer in the army, a fighting unit bereavement essence is rampant power and uncompromising when it is not clear who wields the power to whom and for what purpose. The artist wears many colorful medals, decorations and insignia which are made from colorful cookies which are sew to the uniform. The General is standing and staring at the invisible crowd, like speaking to the public which does not exist, he is reading aloud the apocalyptic vision of the prophet Ezekiel (Ezekiel xviii), which includes the famous phrase "The fathers have eaten sour grapes and the children's teeth are set on edge." The text deals with the concept of sin, and the idea sins pass from father to son and from generation to generation, when it is not clear what is sin, but is known to severe punishment, perhaps even death. The text deals with the question of who lives and who dies. The General read the text with concrete hollow voice, his eyes are empty, he does not own an original opinion, He is standing and reciting the ancient furious demagogic tone. As he read the prophecy he pulls his medals chest one after another, tearing the insignia of his shoulders, and stuffing cookies into his mouth trying to swallow them without stopping to speak. The eating activity is in contrast to the speech activity, and the general is choking on dry biscuits and begins to cough. The general trying to take his heritage and swallow it, but this choking him, leaving him with no message indecipherable, he is engrossed in fury and violence without justification and meaning with no beginning or end. The activity is also a comic and childish. In the final stages. Cookies squeeze out from the general mouth and painting the tongue, muzzle, lips and teeth in purple make him a sub- human, an animal creature and he is losing the human filming. The cookie's gag action neutralizes the leftover text of his last means. The words that made chewing colorful cookies falling to the ground and crushes. The human voice is distorted and hoarse and the general becomes grotesque, comic and menacing at the same time, he continued to preach his messianic fervor text.